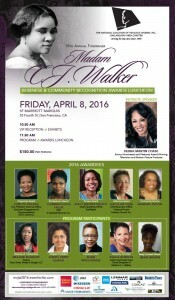 GGSV’s Melanie Shelby serves as Mistress of Ceremonies for the 18th Annual Madam CJ Walker Business and Community Recognition Awards Luncheon hosted by The National Coalition of 100 Black Women, Inc. of the Oakland/Bay Area Chapter on April 8, 2016. Apply for Free New Booster Car Seats at Seats4Safety.org!! Join Us March 4 for Fiona Ma's Fabulous 50th Birthday! !